There’s something to be said about owning a pet that’s a member of the oldest family of creatures to live on this planet. Reptiles have a strange beauty that is absolutely absorbing. Having a reptile in the house is like having a visitor from another planet stay with you and is the last remnant of an ancient era. Such intriguing and unusual pets are excellent conversation pieces and are likely to impress any friends of the children who own reptiles. Any that aren’t terrified of them, that is! Children who have a fascination with dinosaurs will be naturally drawn towards these pets, as will those with an explorer’s mindset or a leaning towards science. For families seeking a low maintenance pet without allergy triggering fur, reptiles can be an ideal and interesting family addition. Reptiles are excellent pets for children and families with allergies, and an interesting and unique one at that. Kids who desire something different than the classic pet will enjoy reptile ownership and the novel pleasures they bring. These creatures are fascinating to watch, fairly easy to take care of and relatively cheap to maintain, depending on the breed. Reptiles don’t need a lot of attention, although some types can be affectionate, so they are an undemanding pet that children can play with at their leisure, excellent for kids who can’t or won’t commit a lot of time to the upkeep of their animals. Feeding time can be very exciting and is a great show for visiting friends. 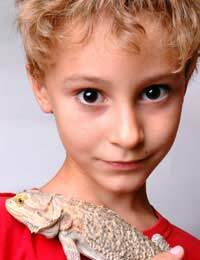 Reptile owners seem to be in a league of their own and your child will likely have an instant bond with other kids who own reptiles, which is a strong social benefit. Health concerns due to Salmonella and children is the largest problem with kids and these pets. A rigorous hand washing routine needs to be put in place to keep young children safe from illness. Many reptiles, including lizards and snakes, eat live animals so kids or their parents need to have a stomach for live feedings. If the temperature and climate of the reptile’s environment isn’t maintained, they can become very ill quite easily and even die. It’s difficult to find a vet that deals with reptiles in many places, which is worth investigating before taking one on as a pet. Certain types of reptile, such as iguanas, can become very hostile during breeding season, and sometimes strike out at their owners during this time. Bites can be quite painful and must be immediately disinfected. Reptiles are very hard to read as well, so sometimes there is little warning as to mood changes. Due to Salmonella and other strains of bacteria that reptiles often carry, a resounding no to pet ownership at this age. Even without direct contact, children can get sick. Many reptile owners get rid of their pets during this phase of their child’s life because of the risk of illness. It’s much better to wait until the immune system of a child becomes more developed. With supervision and with hand washing EVERY time any contact is made with a reptile or its living environment, this combo can work but is not considered ideal. Older children seem to gain more benefit from reptile ownership but this depends on the maturity of the child. Kids need to understand that reptiles do not behave like warm blooded creatures and also carry bacteria that can be harmful to people. On the positive side, kids of this age are still in the dinosaur enthusiast stage, which makes reptile ownership that much more exciting. By now, your child has a well-developed immune system and an understanding of the mentality of these cold-blooded creatures. Hand washing is still exceptionally important, however. The thrills of owning a reptile can be completely enjoyed by kids now and they can handle feeding their own pets, one of the biggest joys for a reptile enthusiast. Children can also feel confident in handling their reptiles themselves, much to the admiration of friends and classmates. Often kids will become so involved in the reptile world, they will want to take on more challenging species as time progresses, and should be encouraged if there is space and a budget. This is a big confidence boost for any child.